for this week is to Compost! We have all heard the environmental trilogy of Reduce, Reuse, Recycle. But there is another—Rot! By composting our fruit and veggie scraps, our newspaper, staple-free tea bags, coffee grounds, dryer lint and more we can save a great deal of garbage every year (even every day!) from going to the landfill. You may think, well food is biodegradable so why can’t it just be thrown away to rot? When food is disposed of in plastic bags in a landfill, it is compressed and deprived of a healthy environment to naturally decompose. Trash releases methane gas into the atmosphere which contributes to the greenhouse effect. Composting our food is a simple way to provide a huge benefit to our environment and planet. Many people collect veggie and fruit scraps in crocks in their kitchen to eventually transfer to their compost bins. 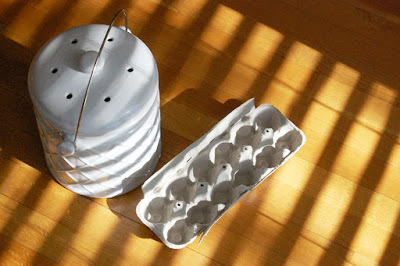 An easy way to provide more carbon than nitrogen when you make this transfer is to re-purpose egg cartons! Tear up a half or whole egg carton into your empty crock, add a touch of water, and then add your produce scraps. When you empty your crock into your compost bin you’ll have a healthy nitrogen-carbon ratio!